Our company Start Your Own Gold Mine provides clients with the basic knowledge, tools, equipment, mining claims and fully integrated and straight forward program to start a gold mining activity. One important part of learning is study of gold prospecting and gold mining books. The Business of Mining by Arthur J. Hoskin, M.E. Getting Gold, by J.C.F. Johnson, F.G.S. Getting Gold, as written by J.C.F. Johnson, F.G.S., is the prepared from a 1898 edition. The gold-mining industry has grown considerably since 1891, and it appeared to the writer that the present would be a propitious time to bring out a similar work, but with a considerably enlarged scope. 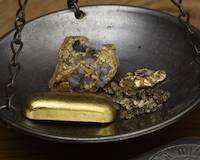 What has been aimed at is to make "Getting Gold" a compendium, in specially concrete form, of useful information respecting the processes of winning from the soil and the after-treatment of gold and gold ores, including some original practical discoveries by the author. The ABC of Mining, by CHARLES A. BRAMBLE, D.L.S. The ABC of Mining, free book provided by Start Your Own Gold Mine and written back in 1898 by Charles A. Bramble, D.L.S. Treating fully of exploratory and preparatory work of the physical properties of ores, field geology, the occurrence and associations of minerals, methods of chemical analysis and assay, blow-pipe tests, promising indications, and simple methods of working valuable deposits, together with chapters on quartz and hydraulic mining and especial detailed information on placer mining, with an addenda on camp life and medical hints.